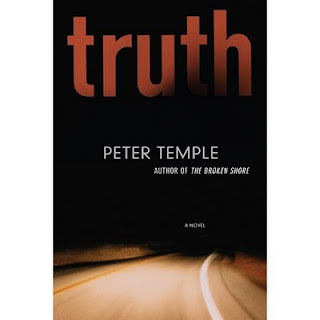 The only Truth in Peter Temple's new novel of the Melbourne homicide squad is not what you might think (I won't spoil the revelation). The novel is a complex story with an ambivalent moral sense, told in terse coded dialogue among the police and an almost stream of consciousness narrative in the third person but from the point of view of the new head of homicide, Stephen Villani. Villani is landed with two murder scenes, one a young girl in a new high-rise development and the other a torture-murder in a drug gang's house. He's also dealing with the breakup of his marriage, the descent into drugs of his youngest daughter, the revival of an incident from earlier in his career that threatens to land him in jail, and his father's refusal to leave his fire-threatened farm. There's more, but that gives you an idea of the mixture of plotlines in the book. Truth brings together the social conscience of The Broken Shore with the quick, oblique language of the Jack Irish books (as well as the horseracing theme of those books). Three characters from the other books make an appearance: Jack Irish does a cameo and Joe Cashin and Detective Dove from The Broken Shore are secondary but important characters (Dove, recovered from the shooting in the earlier novel, more so than Cashin). Villani is facing a multiple fork in the road of his life and career, and it isn't clear until the very end which way he will go (a lot in fact is left unresolved at the end, more in his private than his professional life). And which way he goes is not altogether by choice: fate and the influence of various superiors have a big part in the decision. There's so much going on that the two murder cases sometimes recede a bit into the background--though always nagging at Villani's mind and conscience. So although there is a very large element of the police procedural, the progress in the cases is less central (and sometimes more confusing) than in a straight procedural. In fact, the novelist I was most often reminded of is Joseph Wambaugh: like Wambaugh, Temple derives most of the comic element in the story from the dry wit and interplay among the cops. And like Wambaugh, crimes or moral lapses among the police are a big part of the atmosphere (along with stories about things that have happened among the cops in the past). But although authenticity in the depiction of the police is achieved by both, Temple reaches beyond that toward the complexity of Villani's life as a whole (partly in the stream of consciousness narrative that I mentioned before, a narrative style not chosen by Wambaugh in any of his books that I've read), from childhood forward, and also provides a concrete sense of Melbourne and Australia quite different from Wambaugh's southern California. Having caught up with Temple's current writing, I'm driven to go back and find the 2 Irish novels that I haven't read, as well as a couple of stand-alone books that I've had a hard time finding (but are apparently available second hand here and there on the Web). I have a nagging sense that I haven't captured something important about Truth, so I may come back to it--it's a book that has a lot going on (and a lot to offer). Great review. Everyone I know who has read Truth says they will re-read it one day. It really is such a multi-layered, rich book. I think it is so complex that it has defeated many reviwers, also - quite a few reviews I've read on blogs or in newspapers have basically given up on trying to encapsulate the book as a whole - quite a challenge.